I love physical copies of video games that are compilations. 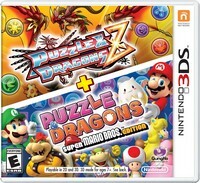 Puzzle & Dragons Z + Puzzle & Dragons Super Mario Bros Edition is one such video game that has such potential. Too bad Nintendo is flopping as a publisher for GungHo Online Entertainment. Families get two video games on the cartridge of Puzzle & Dragons Z + Puzzle & Dragons Super Mario Bros Edition. Puzzle & Dragons Z + Puzzle & Dragons Super Mario Bros Edition looks good graphically. There are some enticement to lust issues, and some violent content in this hand held video game. The Mario Edition looks a bit better than the Puzzles & Dragons Z. Thankfully there are none of those hated in-app purchases. Plenty of characters in Puzzle & Dragons Z + Puzzle & Dragons Super Mario Bros Edition are fleshed out quite well. Some of the issues families will have with Puzzle & Dragons Z + Puzzle & Dragons Super Mario Bros Edition is the gambling, and religious teachings of evolution. That is on top of the two issues the ESRB discovered thanks to their cursory examination. The game play in Puzzle & Dragons Z + Puzzle & Dragons Super Mario Bros Edition starts really easy, and gets harder as the game progresses. At first it is simple to match three, get combos and beat the enemies. Later on players must pay attention to types, and special skills of the support characters. As well as merge support characters to make more powerful characters. At the end of the day I enjoyed playing Puzzle & Dragons Z + Puzzle & Dragons Super Mario Bros Edition on the Nintendo 3DS. I wish more quality apps were being ported over to the physical copy realm. Like we have written about in our News section of the Family Friendly Gaming website (the red stories). Dues to the multiple issues with Puzzle & Dragons Z + Puzzle & Dragons Super Mario Bros Edition I believe the age rating should be E10+.